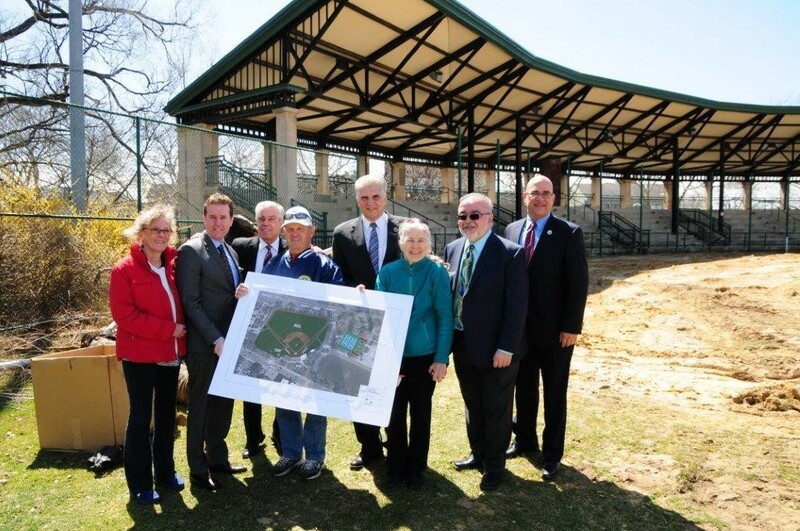 Newark, NJ – Essex County Executive Joseph N. DiVincenzo, Jr. announced the baseball field and tennis and basketball courts in Essex County Riverbank Park will receive a facelift on Monday, April 9th. The improvement project is part of the County Executive’s ongoing initiative to continue the revitalization of the historic Essex County Parks System and ensure its recreation facilities meet the needs of the community. “The Ironbound in Newark is one of the most densely populated neighborhoods in the state with limited open space for recreation. Providing the most up-to-date facilities is important to promote community health and provide places for residents to play,” DiVincenzo said. “Children and organized teams will be able to maximize use of the baseball field with a new synthetic grass surface and installing modern surfaces will ensure the basketball and tennis courts are able to meet the public’s needs,” he added. “These improvements would not be possible without the ongoing support and cooperation we receive from our longtime community partners, SPARK, the Ironbound Community Corportation and the Down Neck Sports Community Group,” the Executive pointed out. The baseball field will be upgraded with a synthetic grass surface and new fencing and foul poles, creating a fenced in bullpen to maximize safety and updating the dugouts. The tennis and basketball courts will be resurfaced and repainted, and new equipment will be installed. The announcement of improvements was met with support from local officials. “The County Executive recognizes that parks are part of social justice that provide equity and fairness. More importantly, he listens to the needs of the community and does what is necessary to meet those needs,” NJ State Senator and Deputy Chief of Staff Teresa Ruiz said. “The Freeholder Board if proud to partner with the County Executive and is committed to provide its support for these types of projects,” Freeholder President Brendan Gill said. “The Ironbound is one of the most densely populated areas in the state and that makes this project even more important. People will appreciate the work being done here and are looking forward to it,” Freeholder Robert Mercado said. “It’s important that we have wonderful recreation facilities because there is limited open space in the Ironbound neighborhood. This is an example of what is being done by our County Executive to improve the quality of life for our residents,” Freeholder Patricia Sebold said. “Our parks are second to none when compared with other counties’ facilities. Providing opportunities for our youth is important,” Freeholder Len Luciano said. “Upgrading the baseball field along with the tennis and basketball courts will allow children today to enjoy the park just like I did when I was there age,” Sheriff Armando Fontoura pointed out. “This is becoming a habit – coming to our parks and announcing improvements that the County Executive and Freeholders are making. We applaud them for taking the lead and doing what is right for our residents,” Newark Councilman Augusto Amador said. “I have spent my whole life coming to this park. I know that our children will utilize these facilities,” Neil Mitgard from the Ironbound Little League and Down Neck Sports Group said. “We are all stewards for these precious acres that have been passed down from generation to generation. Joe, we appreciate your vision for being able to see the potential of a site when nothing is there. We appreciate the care you are giving to our open spaces,” Nancy Zak from SPARK said. Mott McDonald from Islen was awarded a professional services contract for $69,800 to design the improvements in Riverbank Park. The Landtek Group, Inc. from Amityville, N.Y., was awarded a publicly-bid contract for $2,060,190 to perform the construction work. The Essex County Department of Public Works is monitoring the project to ensure delays are avoided. The project is being funded through the Essex County Capital Budget and with a grant from the Community Development Block Grant program. It is scheduled to be completed in the summer of 2018. In 2003, Essex County remediated contaminated soil from the park, installed a synthetic surface soccer field and scoreboard, repaired the wrought iron fence and made significant landscaping improvements. Because of regular wear and tear, the synthetic grass surface on the soccer field was replaced in 2013. In 2016, the playground received new apparatus and a rubberized safety surface. Essex County has worked cooperatively with the Down Neck Sports Community Group and SPARK to receive grant funding from the NJ Green Acres program and the Essex County Recreation and Open Space Trust Fund to fund improvements to Riverbank Park. The Essex County Park System was created in 1895 and is the first county park system established in the United States. The Park System consists of more than 6,000 acres and has 23 parks, five reservations, an environmental center, a zoo, Treetop Adventure Course, ice skating rink, roller skating rink, three public golf courses, golf driving range, two miniature golf courses, three off-leash dog facilities, a castle and the Presby Memorial Iris Gardens. Riverbank Park was added to the Essex County Park System in 1907 and designed by the Olmsted Brothers firm. At 10.77 acres, Riverbank is the third smallest park in Essex County’s system, but it is one of the most heavily used.